Sustain derives from sub- [under] and tenere [hold]. It means to hold under, and thus keep up, as in "a sustained musical note'. Environmentally, a sustainable city is one that can keep going because it uses resources economically, avoids waste, recycles where possible and adopts policies that bear fruit in the long term. Forestry is the oldest and best example of sustainable planning. Von Carlowitz, in 1713, explained that if forests were not planned on a sustainable basis, humanity would plunge into poverty and destitution, as was happening in Central Europe at that time (Speidel, 1984). Foresters aim at the highest timber yield that can be sustained. If the periodic harvest matches incremental growth, equilibrium will be maintained. The Bruntland Commission, in 1987, defined sustainable development as "development that meets the needs of the present without compromising the ability of future generations to meet their own needs' (Bruntland, 1987). This definition is often quoted verbatim, possibly because its meaning is so hazy. What is "development'? Do the "needs of the present' include two cars and two homes for each family? Who knows the needs of future generations? Even forestry is not sustainable development within the Bruntland definition, because forests cannot be developed to meet "the needs of the present'. Then again, if future generations take our advice about recycling, new timber reserves will hardly be necessary. Nor will they be required if current moves towards the silicon office, the Internet book and the fibre optic data highway come to fruition. 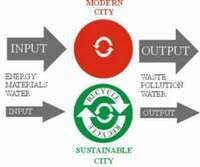 For all these reasons, I prefer Eco-city to Sustainable City. Eco- means home. Eco-city means "home city', implying that a whole city can be looked after as wisely as a private house, economically and with cupboards for old pieces of string and empty jamjars. Modernist cities have high inputs and high outputs (Figure 8.1). Eco-city planners should aim to produce cities with lower inputs of energy and materials, with lower outputs of waste and pollution. Despite the merits of the forester's conception of sustainability, it remains far from perfect. Modern scientific forestry, which originated in nineteenth century Germany, was aimed at producing a sustainable high yield of timber. But the technique depended on the exclusion of sporting and aesthetic interests from forest management. After 1919, British foresters followed the German example, as did Indian, American and other foresters. Factory methods came to dominate forest practice. In ancient times, forests had been maintained for timber, fuel, hunting, grazing and the gathering of wild food. It has been a great struggle to re-introduce other objectives back into forest management, and doing so has diminished the "sustainable yield' of timber. Fig 8.2 If they take all the advice which is given, there is a danger of sustainable cities being totally joyless.